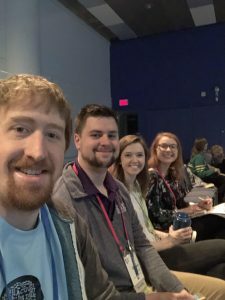 This summer, Rich Tanner, Clinical Professor of Digital Entertainment Technology, attended the Christian Game Developers Conference held yearly in Portland Oregon. Six students from the School of IT and Computing attended with him. The mission of the conference is “bringing salt and light to one of the most influential industries of the 21stcentury”. Tanner spent a little time to tell us more about his experience as an attendee and professor hoping to encourage his students to share their faith through this platform. What is the Christian Game Developers Conference about? The Christian Game Developers Conference has been going for 17 years, and seems to be growing every year. It is a conference for Christians in the games industry, whether they are building overtly Christ-centered games or not. Many participants are utilizing video games, computer games, and even board games and card games to advance the Kingdom. These games have different purposes. Some are to strengthen the Body of Christ, being designed for a Christian audience with a common understanding and background. Others are designed to reach an audience that does not yet know Christ and to pull them into a conversation about Jesus and Christianity. Still, other Christian games are simply designed as wholesome entertainment for Christian families that do not violate Christian beliefs and morals with the questionable content often found in the industry. In addition to these endeavors, the conference also serves as a gathering for folks in the larger games industry who also happen to be Christians. The conference often hosts discussion groups and presentations on what it means to be a follower of Christ in an interactive and multimedia career field. The conference is a place not only for presentations and sharing of ideas and announcements, but for fellowship and fun. Many projects and collaborations are often formed at the conference by various CGDC attendees. I personally have never been to any other conference that looks as much like the Body of Christ in action. 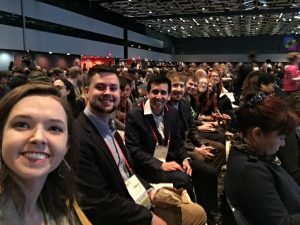 What were you hoping students would get from attending the conference? I was hoping for students to network and get engaged! The collaboration that happens at CGDC is truly something special, and it is my desire to get students plugged into projects and companies that they can be meaningful contributors to. The DET program has already had a couple of students get connected to both jobs and internships based on connections that were made and strengthened at CGDC. It was also my hope to have students walk away from the conference and the conversations that happened there with a stronger sense of their purpose in the Kingdom and in the world at large. I wanted them to be asking themselves what it means to be a Christian who is learning and aspiring to be a game and content creator. Why should students become involved with this? How do they become involved? Students can get involved simply by getting involved with the DET program, the DET Club that meets every week, and by being involved with other students who share their passions and ambitions. Also, connecting with faculty really helps us to help you. There are many great opportunities that come our way, and we want to see you succeed both in the classroom and beyond! Mike Wheeler, senior Digital Entertainment Technology major from Plano, Texas attended the conference. He said that his biggest takeaway from the conference was learning how important stage presence is, including appearance, a working presentation, and properly selling your idea or product to the audience. Kolton Burkhalter, senior Digital Entertainment Technology major from Abilene, Texas said that the idea he took away from the conference was that it’s possible to keep one’s Christian values in your work. He said that the conference also influenced him to want to start a business alongside his good friends who share the same interests. Seeing many of the developers at the conference who were self-employed or worked in a small studio has given him the confidence to be a gaming entrepreneur. Are you a DET student who’s interested in attending this conference in the future? To learn more about the Christian Game Developers Conference, click here. To learn more about ACU’s DET Club, click here. 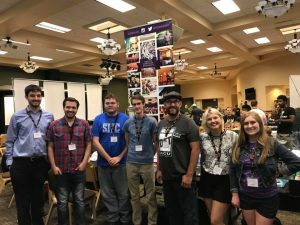 This summer, Rich Tanner, Clinical Professor of Digital Entertainment Technology, attended the Christian Game Developers Conference held yearly in Portland Oregon. Six students from the School of IT and Computing attended with him. The mission of the conference is “bringing salt and light to one of the most influential industries of the 21st century”. Tanner spent a little time to tell us more about his experience as an attendee and professor hoping to encourage his students to share their faith through this platform. 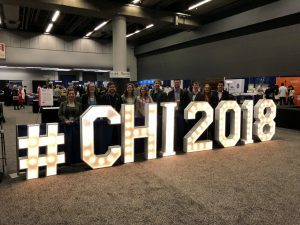 CHI 2018 is a “Special Interest Group in Computer-Human Interaction” conference and the premier international conference for scholarly research and prototype demonstrations for cutting edge interactive technology. It is sponsored by the ACM (Association for Computing Machinery), the primary guild for technology professionals and academics. The conference focuses on the ways in which humans interact with computers and what we can learn from that to design better and more natural user interfaces. This ranges from video game design, to security, to the latest in wearable tech, to years-long observation and interviews in the field about how people use computers, and everything in between. Prather also says that many of the students are now considering graduate school, something that had not previously considered, because of all the positive feedback that they received at the conference. Everyone seeing such a breadth and depth of amazing research, he says, really invigorated their interest in pursuing academics further. We asked students who attended the conference to answer a few questions for us and we thought you’d find each of their comments interesting. Tell us about the experience of presenting your research at the conference. What did you learn from this whole process, beginning with compiling your research in the SIGCHI club to going to Canada to present? Did this experience make you want to engage in more research at school or post-grad? Why or why not? How are you hoping to apply what you have learned about Human Computer Interaction in the future?